The conservation and restoration of oil paintings is a complex practice which incorporates a wide range of treatments responding to the multiple issues that may have caused damages to your painting. The heterogeneous layer structure which construct the easel painting presents a variety of different materials increasing the complexity of treatment particularly due to the natural materials involved (cotton/linen canvas; wooden stretcher). Deterioration may have occurred as the result of material degradation, environmental damages, accidental damages or disasters. The physical consequences of degradation can include structural damages or aesthetic deterioration. Structural damages can include bulges and undulations in the canvas; loss of tensions, removal of the canvas from the lining support; and wearing of the tacking margins resulting in the loss of tension. Tears and cuts/slashes may have also been caused to your canvas which requires mending. Depending on the severity of the tear/cut, the canvas may require lining treatment and there are modern and traditional methods available. Alternatively, if the damages are localised, thread-to-thread tear mending can realign the individual canvas fibres to repair the tear locally. 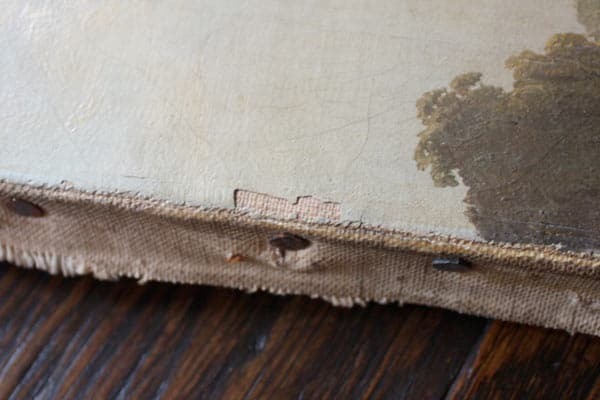 An insert may also be added to the canvas if the tear has resulted in loss of canvas. Keying out, in other words tightening the keys, can also retention the canvas. Lining treatment has experienced historic popularity in the restoration of easel paintings. Treatment describes the application of an additional lining canvas attached with adhesive to the back of your painting to offer structural support and also provide a one-stop treatment to repair large tears and correct planar deformations in the painting structure. Traditionally, lining has included wax-resin and glue compo (rabbit skin glue and flour) and it is quite easy to identify whether your painting has been lined by the identification of two canvases, evidence of compo paste and wax resin residue and also the appearance of the paint surface (flattened appearance). Today, lining is still carried out and can be a highly successful treatment in structurally securing your painting, however alternatives are available. These alternatives include strip lining which describes the application of a secondary fabric to the tacking edges of the original painting and is recommended in cases where the tacking edge has been compromised. 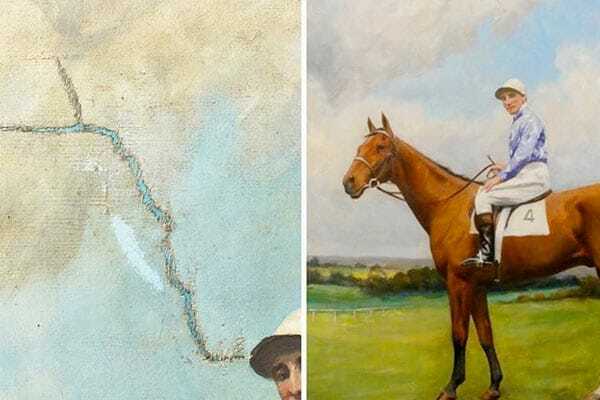 Other alternatives include loose lining where the original painting is removed from the stretcher and a secondary canvas is stretched onto the stretcher onto which the original is then applied. The aim of a loose lining is to retention the canvas without the application of adhesive. Your painting may have flaking paint and ground, craquelure and/or areas of raised/tented/lifted paint. 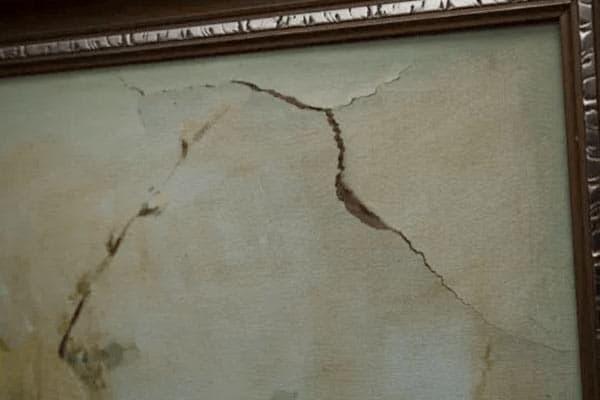 It is advised that if your painting does present these issues that the painting is not positioned face down and ideally stored somewhere safe from any further accidental damages to this unstable paint layer. To stabilise the painting, treatment may include consolidation, facing or even lining treatment. What is consolidation? What do I do if my painting is flaking? If you notice flaking and losses for the surface of your paint layer, avoid the application of pressure or touching the surface and consult a conservator. With regards to treatment, Consolidation of the paint layer will be carried out. Consolidation describes the localised application of adhesive to secure the flaking paint layers to the painting. The application of adhesive may be in combination with heat and pressure by means of a heated spatula or hot air pen which also serves to re-plasticise and lower any raised paint associated with losses and areas of craquelure. For areas of extremely friable paint, or in cases where the paint layer requires stabilising prior to treatment, facing treatment can be carried out. Facing describes treatment where adhesive is applied through Japanese tissue to temporarily secure the paint layer. Crucially, treatment should be fully reversible and leave no residue on the paint surface.